Wirecast Gear gives you a fully configured live video streaming production system that is affordable and easy to use. No need to build your own system. Telestream have done all the work. You can start streaming in minutes, with an end-to-end system configured specifically for your needs. 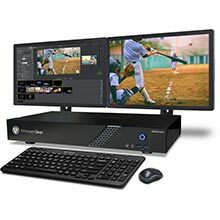 Comes with four HD-SDI or HDMI professional camera inputs and all the live video streaming production features of Wirecast Pro, in a compact, powerful hardware system, Wirecast Gear is a unique blend of performance, ease of use and affordability. Just plug in your cameras and start streaming. Extremely durable and portable. No moving parts except for the fan. Sits on your desktop or can be mounted in a 19” rack setup with optional ears and rails. Take in your backpack on location, or use in a permanent studio setup. Don’t worry about building your own Live video streaming system - we built one for you. Wirecast Gear comes with everything you need to start streaming to Facebook, YouTube, Twitter or any destination on the web in minutes. Plug in up to 4 cameras in the HD-SDI or HDMI inputs, and you’re ready to go. 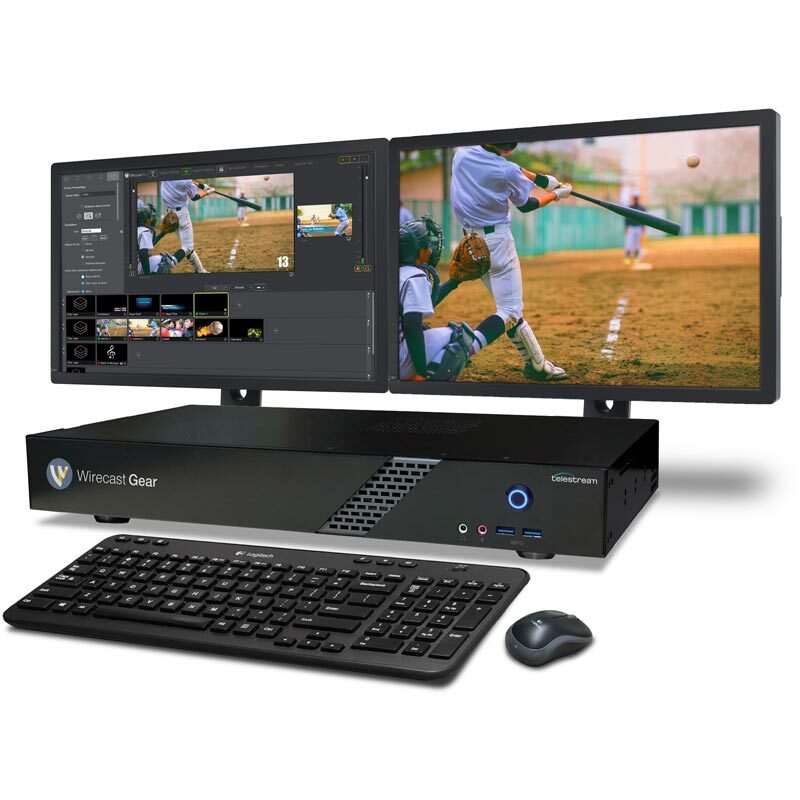 Comes with seven USB 3.0 ports, three display ports, and fully loaded with Wirecast Pro and NewBlue live titling software, plus Switch - our advanced media player. From ingest of live sources to an encoded live stream, Wirecast Gear handles it all. Wirecast Gear has a versatile and convenient footprint, more powerful live video streaming production features. Wirecast Gear pre-loaded with Wirecast Pro, Telestream’s award-winning live video streaming production software. Wirecast lets you switch between multiple live cameras while dynamically mixing in other media such as remote live guests, screen captures, movies, images, and audio tracks. It’s powerful production capabilities include features such as fully-feature audio mixing, dynamic transitions, instant replay, playlists, built-in titles, chroma key, virtual sets, live scoreboards, clocks, timers, and more. When you're ready to stream, Wirecast’s built-in encoding engine allows you to stream high-quality H.264 video and AAC audio over RTMP, RTP and Windows Media protocols for maximum flexibility. 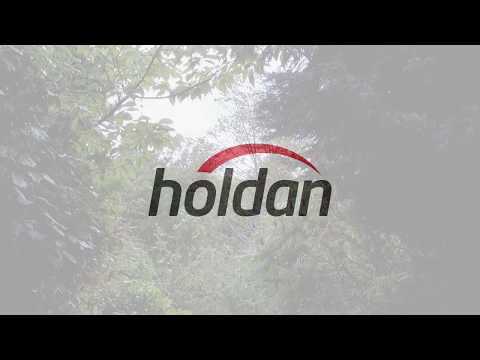 Stream to multiple destinations simultaneously and record. Using the hardware-accelerated Quick Sync encoding, you can easily stream or record high-quality video while using fewer resources. Wirecast GearCare is a powerful upgrade that extends Warranty and Support on a Wirecast Gear system to three years. Included is full Wirecast Premium support for direct access to Telestream technicians, Next Day Air advanced replacement if your system fails and access to the latest versions of our software. Learn more. 1Based on H.264 1080p 29.97fps medium quality. Higher or lower quality settings will affect total video storage. 2System drive is 250GB on all systems.